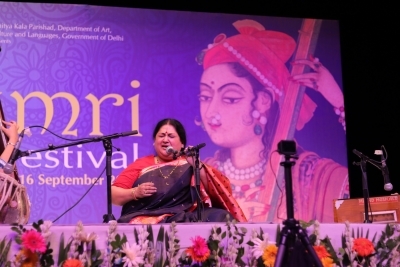 New Delhi Sep 14 (IANS) A three-day festival celebrating the Thumri musical form kicked off at the Kamani Auditorium here on Friday with performances by celebrated classical musicians like Shubha Mudgal and duo Rajan Sajan Misra scheduled. The inaugural day saw performances by Padmaja Chakraborty Jayateerth Mevundi and Shubha Mudgal in front of an overflowing auditorium. Mudgal who was awarded a Padma Shri in 2000 performed the "Bol Banau Thumri" and "Bandish ki Thumri" among others. Thumri a blend of Indian classical music and folk literature is said to be over 500 years old. The remaining two days of the festival will see performances by Nila Sinha Roy Kumud Diwan Rajan Sajan Misra Rahul/Rohit Mishra Indira Naik and Savita Devi. Currently in its 8th edition the Thumri Festival has been organised by Sahitya Kala Parishad of the Delhi government s Department of Art Culture and Languages. It was inaugurated by Delhi s Minister for Social Welfare Rajendra Pal Gautam. It will conclude on Sunday.